Whether you’re an experienced dressmaker or you like to sew in your spare time, there are certain essential tools you will need in your sewing kit. Here’s a rundown on the top sewing supplies and how to keep them in good shape. Tape measure: When you’re measuring fabric, you need a sturdy, rigid tape measure with a lock so that you can measure off long lengths accurately without needing someone there to hold the other end. You can find quality tape measures for sewing at RS. Always keep your tape measure in a dry place to prevent it from rusting. You’ll also need a soft cloth tape to take measurements when you’re making garments. Scissors: When you’re sewing you don’t really want to have to use the same scissors you use for all your other crafting projects. Keep a special pair of scissors designed for cutting fabric cleanly. Make sure you don’t use them for anything else, such as cutting paper and always keep them sharp. Sewing needles: There will always be times when you need to hand sew, whether it’s attaching a button or stitching small toys together. When you’re sewing by hand it’s good to have a selection of needles. Which one you choose will depend upon the type of thread you’re using and the thickness of the fabric you’re sewing. Straight pins and a pin cushion: Straight pins are absolutely essential for any sewing project no matter how big or small. Glass-head pins are easy to see and grasp. Use colored ones if you are working with white fabric. The most practical pincushion is probably one that you can attach to your wrist with a Velcro strap. That way you won’t forget where it is. If you want to get really creative, you can make your own. 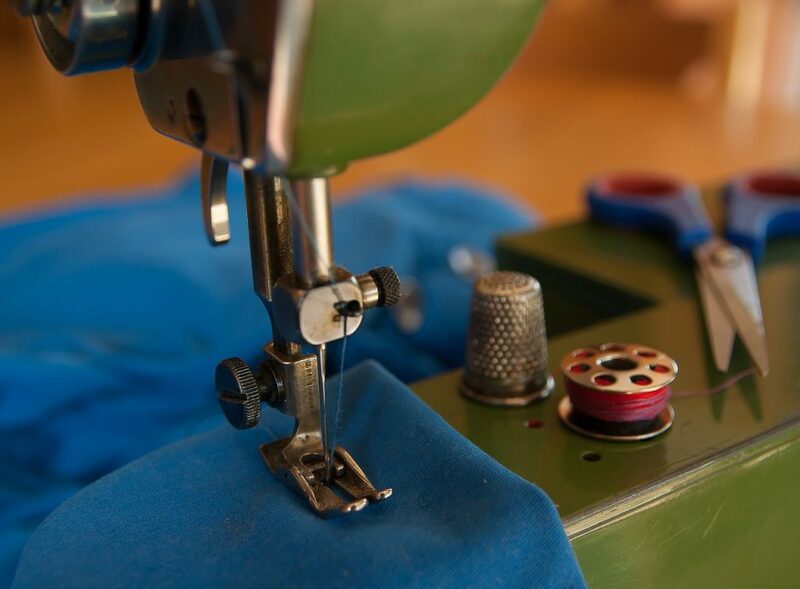 Sewing machine: Hand-sewing is great for doing fine work such as embroidery, but when you’re hemming garments or quilting, you are really going to need a good sewing machine. There are hundreds of machines on the market, so you’ll have to do some research before you buy one. Think about what special features you may need, such as an automatic buttonholer, presser feet, a needle threader, feed dog adjustment, and over-locker. Seam ripper: Everyone makes mistakes and if you’re all the way down a long seam and you realize it’s in the wrong place, you’re already frustrated enough without having to spend hours unpicking the stiches by hand. A seam ripper will make quick work of removing the stiches so you can get on with finishing your project. Thread: You should keep a wide selection of colors so you have something on hand for every project. Use good quality thread that won’t keep breaking as you sew or deteriorate when you wash your clothes. Thimble and threader: Although these are made for hand sewing, it’s handy to keep a threader close by if your sewing machine doesn’t have one. You can use a basic threader to thread any type of hand or machine needle. Now that you’ve got your essential tools together you’re ready to start sewing. Thank you for the post on the top sewing supplies. I think one of the most basic supplies but one of the most needed is sewing needles. There are also a variety of different types depending on what you are sewing and different thicknesses as well.